It’s funny what life throws each of our way. 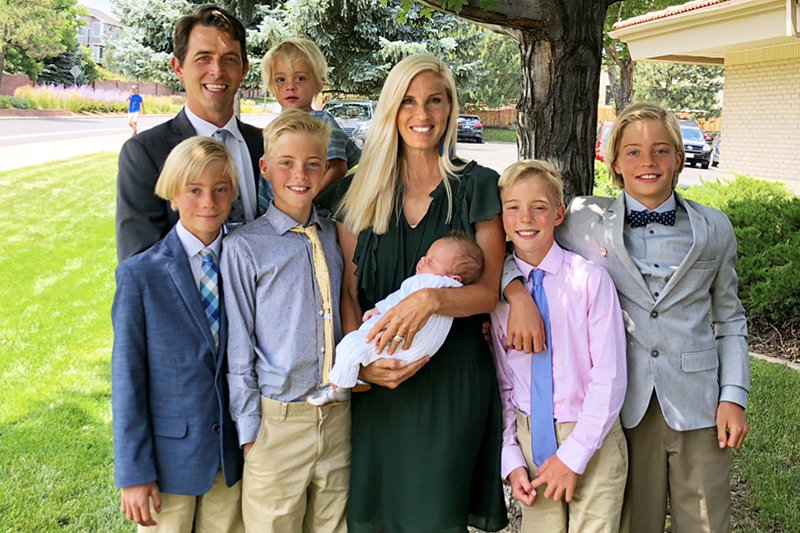 In the case of Autumn Kimball, she never dreamt of having a large family. But now with 6 beautiful, thriving sons, it’s also something she clearly wouldn’t give up for the world. 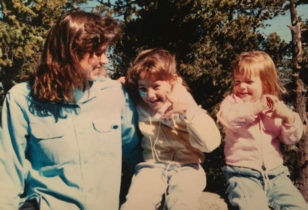 In our latest Mom Talk column, the creative director who splits her time between New York and Colorado tells us about her emotional, hard-fought journey to get to where she is today. The room was oddly quiet. The hum of voices from the halls of the hospital punctured the walls, while the machines next to my bedside seemed to match my heart beat, now beating heavy in my head. The technician had just walked out of my ultrasound to fetch my doctor. For the past six years I had naively navigated the rough seas of IVF. I was working in fashion in New York and I had made a quick assent in my field. I was providing the income between my husband and myself at the time, and was proud to be financially supporting him through medical school at Columbia University. I traveled constantly—to Korea, Vietnam, and Italy. I spent most my time in foreign factories behind deadlines and high stress environments. On one of my flights I had been seated next to a monk in business class. He was dressed in a top and pants made of tight, down-filled channels. The fabric was so stiff and full he could barely bend his knees to position himself in the seat next to me. He made no eye contact, and for the next 22 hours of the flight I decided he was wearing a buffer to protect him from the elements. He slept sound almost the entire fight. As I laid on the examination bed, the gel on my stomach had chilled and slid down the sides of my belly. All I could think about was where I could get the monk’s body-insulating outfit. It would surely help buffer the elements that were coming my way. The doctor came in the door almost unnoticed and without event. She tilted the screen toward her and away from me. I felt a heavy pressure on my left upper arm. My mother is here. I had forgotten I had asked her to come to my next ultrasound while she was in town so she could get used to the idea of her daughter having triplets. The doctor was speaking awhile before I realized I was delaying listening. She had an “all business” kind of expression, as she said, “and this, you see, is baby D.” A, B, C,…and D. The alphabet never felt so ominous. I was now having quadruplets. As I searched for the correct reaction, the doctor interrupted any decision process. She said, “don’t worry we will reduce two of them today.” She followed by saying one of the identical twins had findings that would surely result in fetal death and sentenced cerebral palsy for the other two. I ended up traveling to specialists all over the country. I made a decision that shocked even the deepest corner of my brain. I was going to keep all 4. I was going to give them a chance, I could do that. We crossed landmine after landmine durning my 30 week pregnancy. Bed rest, pain, twin to twin transfusion, laser ablation, enlarged heart, reverse flow, it was endless. They came and all weighed under 2.5 lbs, with my smallest at 1 lb 11 oz. I had my whole future riding on their tiny bodies. With each childhood hurdle it was as if time moved like molasses. The NICU, 20 bottles a day, 30 diapers a day, pacifiers, reflux, oxygen tanks, at home monitors and alarms. Four potties in the yard for potty training, a four seater stroller, homemade baby food, four bikes, four skinned knees, it had been the slowest tidal wave, and it had taken out any known navigation or previous landmarks in my life. When the boys were five and our lives had “normalized,” I got pregnant with natural twins. It was shocking. To be frank, it felt like stumbling onto the holy grail of fertility. To be naturally pregnant and with twins, it seemed impossible. As it turned out, it was impossible. I had conceived them in the “corner of my uterus.” It was a specific and rare kind of ectopic pregnancy called a cornual pregnancy. I was driving my kids home from school when I felt amazing amounts of pressure, to the point where I couldn’t catch my breath. I managed to get home and crawl to my bathroom. I quickly awoke on the floor and realized I had blacked out and hit the floor hard. My arms and feet cramped and curled in becoming lifeless and weak. I was in serious trouble and I knew it. I told my four 5-year-old boys to go get help. To stop anyone on the street and have them call 911. My mother’s unheeded prompts to get a landline repeated in my head. I army crawled to the computer and struggled to write a short email to my husband, knowing he was in surgery. “Help in so much pain, 911…” I fell to the ground taking out the computer and throwing up all over the carpet. I woke to my son kneeling in my puke trying to feed me a Dorito, while he said “mom?” And with that I left my body. My husband somehow got my email. He came home and found 4 small boys in the front yard, scared to leave the driveway for help. He found me unconscious and drove me to the ER. My uterus ruptured like a popped balloon and I was bleeding out. They tried to fix my uterus several times by shaving it down and sewing it together again, but it wouldn’t close. I had four transfusions while in surgery and I woke to a surgeon sleeping outside my door. He was sure I was going to rupture again and he knew there wouldn’t be much time to fix it. I recovered, but resembled a shipwreck rather than a woman, let alone a mother. As life does, it raged forward like a freight train or—in my instance—four unaware boys who preferred affection and mom time. 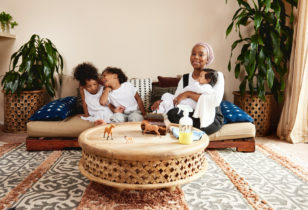 So, like most mothers, I learned how to heal under the love and care of my children. But my soul had been dented like a used car. I was determined to somehow get those babies back. It wasn’t something I talked about or shared, I knew how illogical it sounded. No matter, it became my mission. We moved to Australia and lived one of the best chapters of our lives. We had been through a lot and decided to avoid the responsibility of settling down. My body healed and my family grew stronger and more stable under the healing rays of the Aussie sun. We landed back in the U.S. and I went directly to a specialist. We were looking into surrogacy, but left with a plan to try to carry myself (even if it wasn’t fully championed by my doctor). 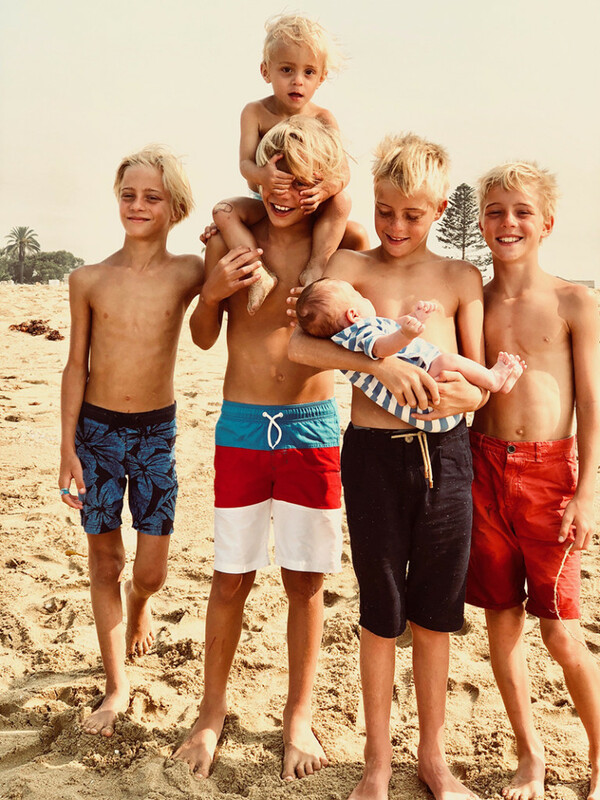 My heart leapt ahead of me at a gazelle pace, leading me through IVF now 9 years after the quadruplets. I was on cloud nine. I had my sweet boys and a chubby singleton on the way. However, at 26 weeks, in the middle of the night my water broke and I found myself hyperventilating in a hospital bathroom as I changed into a gown that symbolized bed rest, and dread. My little boy was only 1 lb 14oz and we needed to keep him inside of me as long as possible. My uterus clung to him for 2 weeks longer. At 28 weeks my tiny baby boy Tor came into this world. He was beautiful. He weighed in at 2 lbs 7oz. He made my family expand in our ability to love, show tenderness, and patience. So, why have anymore? Any women who has done IVF will tell you the embryos that are left behind in storage haunt you. For the first time I had four frozen embryos. As I looked at Tor I knew he was 9 years younger than his brothers and I knew he would fight boredom of being the only child at home. So, to have another seemed doable. I already had 5 kids, was 6 really different? I went through every last embryo and lost three girls back to back. I cried hard and kept moving forward. My last embryo was a boy and it took! For the next 36 weeks I fought the fear of him coming too early or pushing my uterus too far. I had so much to loose. His 6 pound, pink, chubby body was placed in my arms full term and never went into the NICU. As we left the hospital I experienced something I never had before. Freedom, of being a mother without cords and tubes and nurses that replace you as you leave your baby in their care in the NICU. Every roll on his body I made and was somehow life affirming and gratifying as a woman. When I got him home, it felt like the invisible mom guilt had lifted. I had given everything I had to get all six boys here. I had willingly sacrificed my career and endless opportunities to bring them all here. I had never desired a large family and was honestly aware that having six kids was for women who were “good” at being a mom. I don’t really think your allowed in the club until your kids turn 40. However, I aspire to be “good”.